More than 4 million American children spend at least part of the day at child care centers. How widespread is lead contamination of the tap water at these facilities? 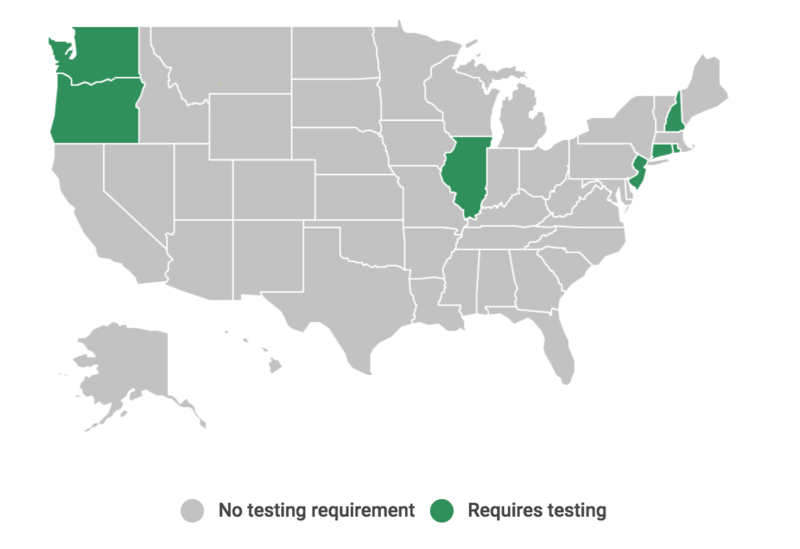 Because only seven states require child care centers to test for lead, it’s impossible to say. But a recent study by the Environmental Defense Fund is alarming: Drinking water at more than half of the child care centers tested in four states had lead levels that could harm children’s health. EDF tested the drinking water at 11 child care facilities in Illinois, Michigan, Mississippi and Ohio. Collectively, these facilities cared for more than 1,000 children, most of whom were under the age of 6 and from low-income families. Researchers found that the water at seven of the facilities contained lead levels that exceeded the level EDF scientists determined was protective of children’s health. Water at five of the facilities had lead levels well above the Environmental Protection Agency’s so-called action level, and at two facilities, the water had about six times as much lead as the action level. The EPA’s action level is 15 parts per billion, or ppb, of lead in drinking water. Water agencies with lead levels above 15 ppb must act to reduce the water’s lead content. But health experts believe the 15 ppb action level still exposes children to too much lead. For their tests, EDF scientists determined a safe level of exposure was 3.8 ppb. The facilities EDF evaluated served as few as 25 children and as many as 213. Nine facilities were in commercial buildings and two were in converted homes. The buildings were constructed between 1910 and 1995, but lead was highest in facilities built in 1956 and 1990. EDF found lead pipes in two buildings, but the primary sources of lead contamination were lead faucets and fixtures. Lead is a severe neurotoxin that can cause health damage that lasts a lifetime. Even small amounts of lead can lower a child’s intelligence, cause behavior and learning problems, slow growth, and harm hearing. Ongoing lead exposure significantly affects a child’s intelligence, and if not stopped, will continue to harm their nervous system development. The best way to protect children from lead is to eliminate sources of lead exposure all together. Children absorb half of the lead they ingest and if a child is malnourished, they will absorb lead faster. According to the EPA, as much as one-fifth of a child’s exposure to lead is from drinking water. The EPA also estimates that up to 60 percent of formula-fed infants’ lead exposure can come from water used to mix formula. In California, the state legislature is considering EWG-sponsored legislation to require water testing in child care centers. AB 2370, by Assembly Member Chris Holden, D-Pasadena, would require licensed child care centers – facilities that care for more than 700,000 children a year – to test their drinking water for lead contamination and ensure that the contamination is abated. An EWG-requested state budget appropriation would also provide grants to help child care centers conduct testing, and replace leaded fixtures and pipes. The bill has enjoyed broad bipartisan support. It passed the Assembly and the Senate unanimously and will soon be signed or vetoed by the Governor. This article was updated September 2018 to reflect the legislation’s current status.